I’ve been spending a lot of time thinking about gratitude and looking at life with a more positive take. Our last couple of years have been progressively more and more difficult, and to be honest, I’ve had a hard time keeping a positive attitude. Which is where this awesome Gratitude Grabber project comes in! 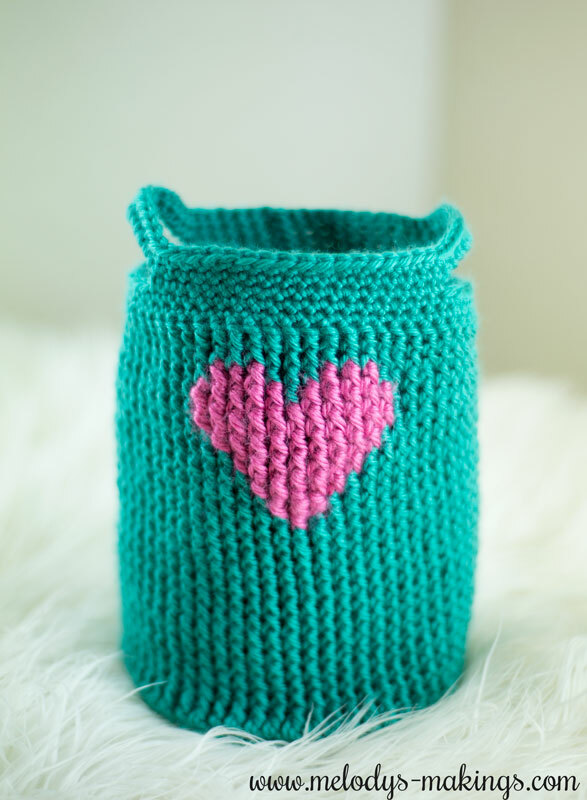 This little basket is made to be filled with gratitude. Every time something you’re truly grateful for happens, simply jot it on a small piece of paper and toss it in this basket. Soon your basket will be overflowing, and you’ll probably be aware of more of the little amazing things that happen daily in life. This free crochet basket pattern features worsted (4) weight yarn and size 5.5mm (I/9) crochet hook. I used Red Heart Super Saver. Gauge is not important for this project. Basket measures approx. 9 inches (23cm) in height. “Next stitch” refers to the very first stitch of the round if used at the beginning of a round. Repeat Round 7 until your project measures approx. 3.5 inches (9 cm) in height from the start of the edges. Pick up Color 2 yarn and alternate between working with the two colors as designated. For a clean color change, complete the final yarn over of the DC before the new color using the new color yarn. Loosely float the yarn back to the beginning of the heart each round. Drop and cut Color 2 yarn and continue working with Color 1 only. Round 22: SC each stitch around, slip stitch into first stitch. What a marvelous idea. Will make one for each of my grandchildren for Christmas. Gratitude this something I do every day pray for my smallest blessing. daily rituals one must do with a small growing family is all consuming. all too fast. Keep building and sharing your thoughts. Happy day! Battling so many things, illnesses, finances, mental health, everything it seems. And so much of it beyond my control. I try to count my blessings and remind myself to be grateful and show gratitude but I fall behind and struggle with it. I pray to remember and do better. I just keep asking for help to be a better me. Thank you, for sharing even more. Thank you so much for this pattern what a great idea!!! Very cute basket. Thank you for the pattern. Gratitude to God is life changing. My favorite way to lift my spirits is to make a special effort to appreciate the beauty around me. I have friend who is very sensitive to beauty. When I was deep in grief and the world was muted, I tried to look at my surroundings through her eyes. My heart was lifted by the love of my friend and the beauty she could see.